We are missionaries serving with New Tribes Mission. Our home country is Western Australia and our hometown is Perth on the Swan River. We served with CLF Australia from its founding in 1980 to 1994. Following this we trained at NTM and served on the Sydney NTM staff for four years. In 2000 we moved to our NTM supply centre in Hoskins, West New Britain and have been there since that time. We have two married children, our daughter Amanda and her husband Michael Hunt with Keziah their new baby. They are preparing to serve in a cross-cultural ministry with SIM in Africa having a desire to teach missionary's children and young pastors. Our son Johnathan and his wife Candy with their new baby Malachi are preparing to join us in the Islands of P.N.G. in January 2006. They completed their Cross-cultural Studies at the NTM centre in New South Wales in 2004. We believe that according to scripture Jesus Christ is the Son of God, not born of the seed of man but of God. We also believe that He was promised in ages past to Adam and Eve and consequently to mankind to be a propitiation for our sin which was incurred through them. We believe therefore Jesus Christ is the very Son of God and not of Adam's line, God in the flesh and without sin who subsequently took upon Himself the debt of death that we were born to in Adam and by which we also became estranged from God. We believe that we (mankind) rejected God having chosen to be independant from Him and so have alienated ourselves from Him (He being perfect who therefore is not able to look upon sin). We are therefore rejected because of this our natural state, being of the line and flesh of Adam desiring to do without Him and wanting only to live for ourselves and in our own way. Now however, we have been made righteous in Christ God's Son because of the death payment He made freely on our behalf clearing the debt that was due. We believe that Jesus Christ, being God in the flesh is part of the Godhead, that is one God consisting of the Father, the Son and the Holy Spirit. He is the only God and Creator of all things and there is salvation found in no other. Acts 4:10-12, "Be it known unto you all, and to all the people of Israel, that by the name of Jesus Christ of Nazareth, whom you crucified, whom God raised from the dead, even by him doth this man stand here before you whole. This is the stone which was set at naught of you builders, which is become the head of the corner. Neither is there salvation in any other: for there is none other name under heaven given among men, whereby we must be saved." We have believed in this His wonderful hope and by this His wonderful love and grace have stood since 1973 and we serve Him because of it. We started serving with New Tribes Mission in 1995 in publications at the Australian HQ in Sydney. Then in May 2000 we relocated to Papua New Guinea where we have worked since to provide a ministry of producing printed materials for literacy and bible teaching materials for our co-workers in isolated tribal locations. Most material is translated and prepaired for use by the missionaries in village locations and then forwarded to us for publication. Our last term in PNG was largely taken up by a caretaking roll but now we have returned to our office in Hoskins to our main roll of supplying literature and literacy helps to our missionaries in the Islands Region. We are stationed at the New Tribes Mission supply centre in Hoskins a town in the province of West New Britain south of the equator. 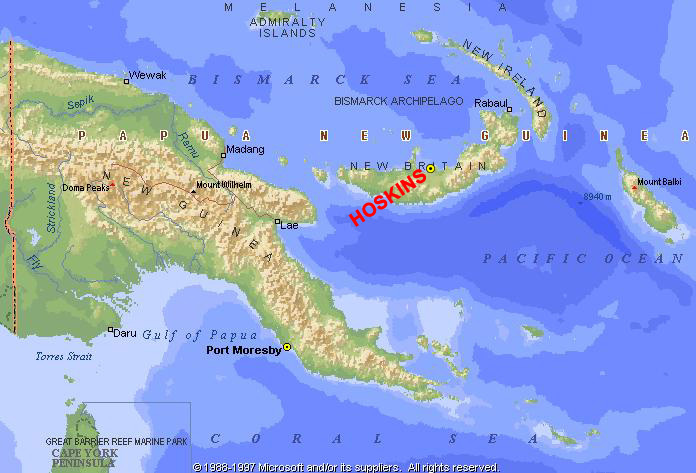 This is part of the larger “Islands Region” of Papua New Guinea, east of the PNG mainland. It has a population of less than one million people. Traditional beliefs are animistic worship but most of its people claim Christianity in one form or another. Many however, are impoverished and have a great desire to find God's truth and love. The mapping out and setting up of a system for all literature materials needed by our co-workers as they progress from moving into the tribal location to the establishment of God's Church in those places. We are working on literacy materials for all the locations NTM is working in, particularly those ready to teach. PowerPoint presentations of NTM work in the Islands Region are under production. Follow up of current church planting teams for literacy needs. Another couple to come along side in this ministry to share the load when we go on home assignment in 2008. Field address: T & E Burns, c/- N.T.M.